Philippe Gilbert ended Il Lombardi today in a completely different manner to how he envisaged things, limping into a team car rather than thundering up the finishing straight, arms aloft. The Belgian had intended to celebrate his new rainbow jersey with his third career victory in the race, but it was not to be. He was distanced slightly on the Muro di Sormano, chased back on, but very soon after crashed heavily approximately 70 kilometres from the finish. His team-mate Alessandro Ballan also hit the deck around the same point. The outcome was far better than it could have been, in terms of physical repercussions, but the time lost was disastrous for his race. “In the end, it's a pity because I had good feelings and could have maybe done something,” he said, before recognising that it was better to lose out in Lombardy rather than the worlds. BMC Racing Team Chief Medical Officer Dr. Max Testa confirmed that Gilbert’s final race of the season should result in no lasting damage. “Right now it just looks he just has some bad road rash,” he said, referring to superficial abrasions on the rider’s right elbow, right shoulder and right knee. BMC Racing Team Director Sportif John Lelangue is, first and foremost, relieved that the current and past world champions were not badly hurt. Looking beyond that, he believes the race win would otherwise have been possible, and so he’ll regret the events which caused the two big names to fall. “Without this, we would have had five guys in the final and it would have been a different situation for Philippe,” he explained. 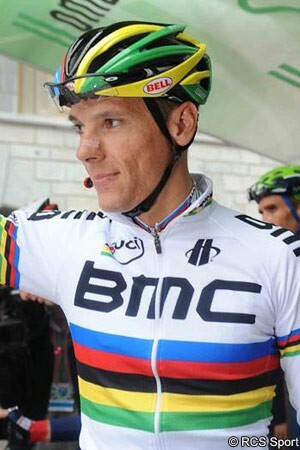 “He was having a great time with the rainbow jersey and everything was going according to plan. We had good teamwork in the beginning and when a group of 60 riders went away, we had the whole team there. Then, in a group of 12, we were lucky to have Steve Morabito. So there was no pressure for us to ride. While the race win proved impossible, Mauro Santambrogio clocked up his top result of the season in netting fourth place. He was in the chasing group behind the solo victor Joaquin Rodriguez, and was to the fore in the sprint to the line. It’s not quite the outcome the team was hoping for at the start of the day but, under the circumstances, it was a solid result.